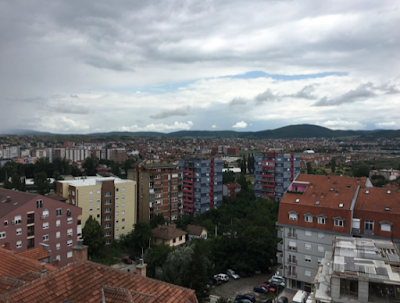 After we had spent the night in the north of Kosovo, early on Friday morning (15 June), I started the day by going for a run around the hotel. I was quickly stopped by a police car. The two Kosovar police officers asked for my papers, which I happened to have with me. They were not really convinced by my story (Frenchman, from Amsterdam, with a Bosnian name???). After asking me follow-up questions and checking with their colleague, via walky-talky, the information on my passport, they let me go. After this slightly uncomfortable encounter, I joined the rest of the group and we had a quick bus ride to the University of Pristina Kosovska. It is a Serbian state-funded university temporarily located in Mitrovica. 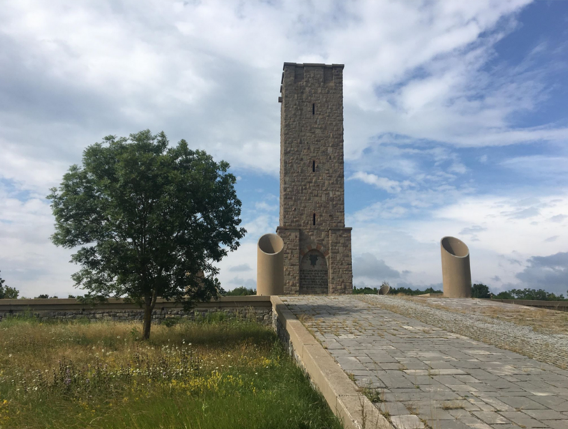 For how long, no one really knows – the man who gave us a presentation was not even convinced that the university would ever move back to Pristina. He informed us that, unfortunately, the diplomas delivered at their university are not valid abroad, for they are provided by a parallel university; this is an issue they are currently trying to solve. The university representative also expressed the wish to remove politics from the university and to live a more relaxed life. Indeed, the tense relations between the North and the South of the country, as well as with Serbia, are a major obstacle to the development of the school nationally as well as internationally. The main concern of the university, as expressed by their representative, is now to improve the facilities for students. 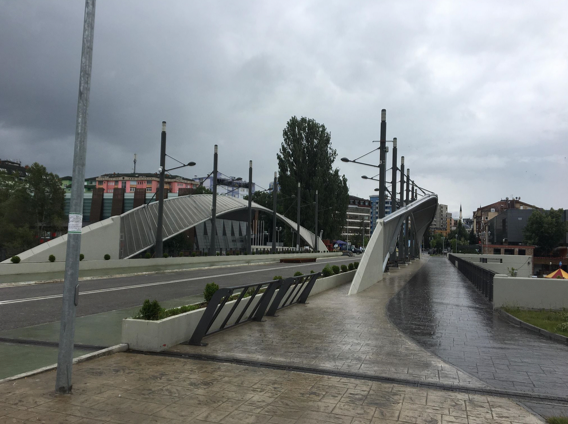 We then walked in the city of Mitrovica and stopped at the Peace bridge, which connects the Northern, Serbian side of the city, to the Southern, Albanian part. Cars are not yet allowed to cross, but people are. The representatives of the New Social Initiative arrived and led us to their office – somewhere North of the city. Their presentation and, more specifically, their trust in the power of civil society in building peace was truly inspiring. 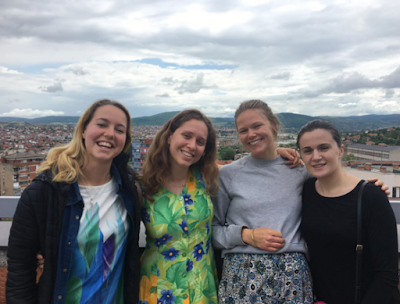 It was also refreshing to hear the perspective of Serbians, and to be reminded that people on both sides of the ethnic divide are spending their time and energy to build peace. 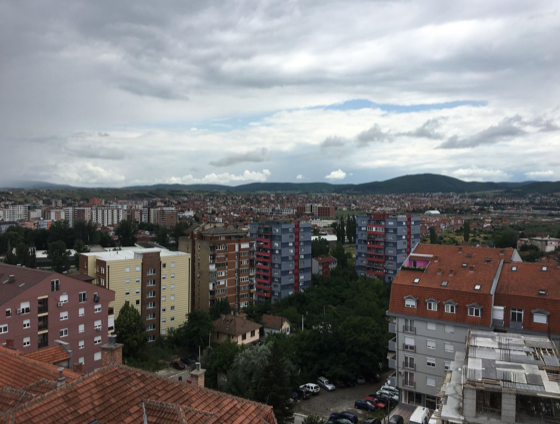 From the balcony of their office, on the 10th floor, we had an absolutely breath-taking view of Mitrovica. It was easy to see where the North ends and the South begins, since the two halves of the city are separated by the river. Yet, I found that the architecture of the North and the South was very similar. In fact, it would have been easy to miss that the city was divided. Only because we had been told about the conflict beforehand could we understand the view we were seeing. This is, I found, something worth thinking about: how many times have we visited countries and cities without really studying their history, and how many times have we been, therefore, completely oblivious to the historical, cultural or social meanings of the places we were seeing? After a round of questions, we left the New Social Initiative offices and walked towards the bridge. Apart from one KFOR car parked at the entrance, I must say it looked like any modern bridge. On the other side, we found a little fast-food restaurant where a couple of us grabbed lunch. They were not showing the football game, unfortunately. But considering, I only paid 1.50€ for an amazing burger and some fries, I really cannot complain! We then went back to our UN bus, and took off towards the Field of Blackbirds where the famous battle of Kosovo took place in 1389. A big tower stands in the middle of the field, in memory of the fallen soldiers. 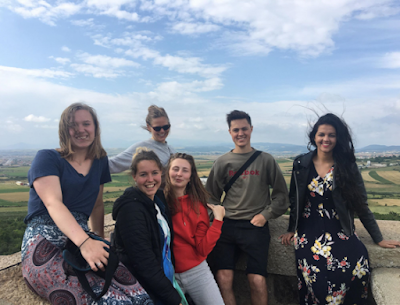 Most of us climbed all the way to the top, trying to imagine the raging battle that took place in the fields surrounding us, over six centuries ago. Finally, we had dinner in a beautiful restaurant in the woods, next to an enormous swimming pool. The dinner was excellent (as always) especially the starters. As Cristiano Ronaldo was scoring a hat trick for his first game of the World Cup, we enjoyed the fresh air of the evening in a gezellig atmosphere, happy to be back home, in Pristhina. In the evening, Nathan, Suzy, Lisa, Lou, Chiara and I went to have a drink near the centre; we did not make it too late, however, knowing we would go out the next day.